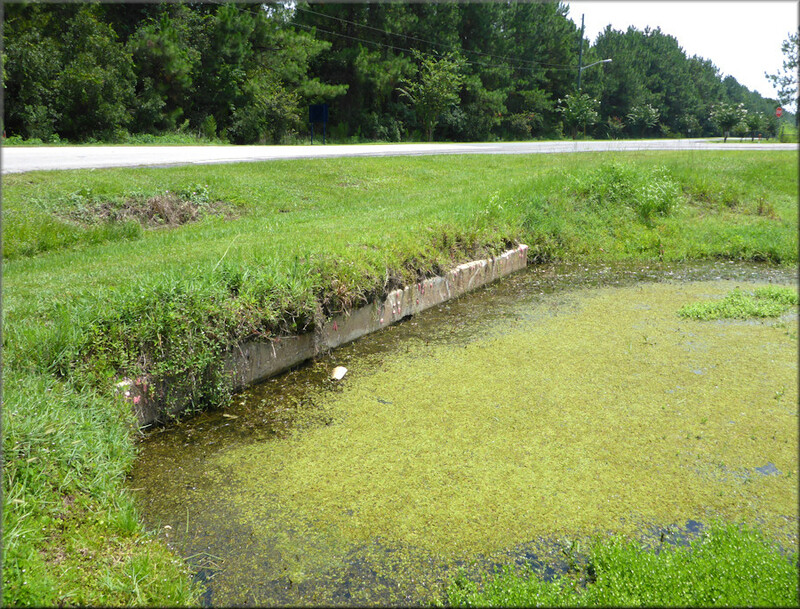 During a field survey on July 19, 2015, a population of Pomacea maculata was discovered in two interconnected water bodies at the Gerdau Steel Mill on Rebar Road just east of the town limits of Baldwin in far western Duval County. A large number of Pomacea maculata egg clutches and living specimens were present. Interestingly, an adjacent connected upstream lake/borrow pit was found to contain a population of the native Pomacea paludosa (Say, 1829) [Florida Applesnail] (See: Lake/Borrow Pit At Gerdau Steel Mill) with no evidence of Pomacea maculata seen. However, during a later visit a single Pomacea maculata egg clutch was in fact found. The dispersal pattern of the Pomacea maculata indicates that the species migrated to the area from a downstream portion of the watershed to the north near Interstate 10. A follow-up visit was made to the area on July 23rd to ascertain whether Pomacea maculata were in fact in the drainage system south of Interstate 10 which runs parallel to that thoroughfare for a distance of about 0.75 miles. While access was difficult, Pomacea maculata egg clutches were in fact found in the drainage ditch where the Yellow Water Road overpass spans the interstate. Although this location is half a mile east of the primary area of interest, the find indicates that the entire length of the drainage ditch has Pomaca maculata present. Pomacea maculata egg clutches on concrete culvert. The view is looking east along Rebar Road towards Yellow Water Road.